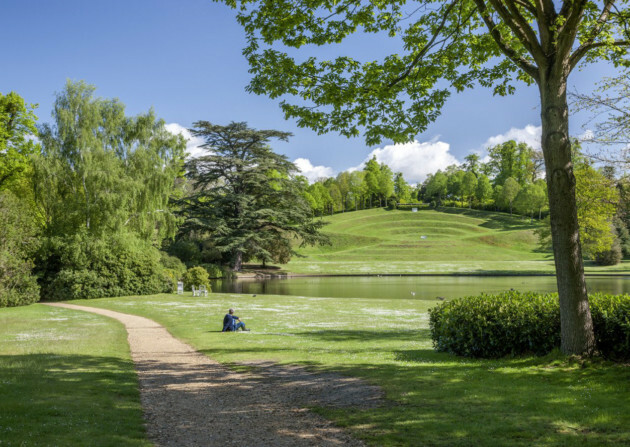 The grass Amphitheatre and lake at Claremont Landscape Garden, Surrey. The Amphitheatre was created around 1722 by Charles Bridgeman. The county of Surrey has long been a popular base for London commuters. Set up home here and you could be in the city within half an hour – an attractive prospect even for 18th-century residents such as esteemed architect and playwright Sir John Vanbrugh, who created Claremont as his private home in 1709. His Palladian mansion was modest in contrast to the statement houses that he designed at Blenheim Palace and Castle Howard, but its gardens took on a more theatrical shape, complete with amphitheatre and ornamental features. The grounds were landscaped and improved upon in turn by Charles Bridgeman, Lancelot ‘Capability’ Brown, and William Kent. Claremont House still stands a mile south of Esher, its interiors occasionally open to view outside of its normal duties as a school. The remaining 49 acres of Claremont’s public gardens, once part of the 1,500-acre estate comprising pleasure grounds, flower and kitchen garden, farm and deer park, have their fair share of woodland glades and hidden pockets. As the grounds slope upward to the perimeter of the North Terrace and beyond the ha-ha, the wilder nature of this pruned and clipped landscape can be enjoyed. Perhaps the most intriguing aspect of the landscape is the grass amphitheatre, created by Charles Bridgeman in the 1720s. It was never used as a theatre but was centre stage of the grounds, which were styled in circular symmetry. Bridgeman’s plans saw formal planting around the edge of the perfectly circular ornamental lake, with an obelisk at its centre. By 1738 the lake was redesigned into a more natural entity with the amphitheatre disguised beneath a thick layer of shrubs. Vanbrugh’s final addition to the grounds before departing the property in 1714 was the Belvedere Tower, which he erected as a favour after the sale of Claremont to his friend Thomas, Duke of Newcastle and 1st Earl of Clare – the property name derives from his title. The Belvedere became an interesting entertainment space, where members of the exclusive Kit-Cat Club, a political and literary society possibly met to dine, to stargaze and chat about the issues of the day. The Duke, who became Prime Minister twice, also commissioned Vanbrugh to extend the house to a size more fitting of his political status. Word spread of the impressive statement property and its gardens earned a reputation as being ‘among the noblest in Europe’. Appearances mattered too much to the Duke, who stopped at nothing to satisfy his expensive tastes. Despite near financial ruin, he maintained his life at Claremont, happily residing there with his beloved wife Harriot until the end of his life. In 1769 the property was sold to a friend, Robert, Lord Clive of India whose mark on the estate was to demolish the now dilapidated house and commission ‘Capability’ Brown to rebuild on higher ground. Yet Lord Clive died in 1774, before spending even a night at his new home. The house passed to John, Lord Delaval in 1787 who gifted it to his wayward daughter Sarah and her husband. Her antics and affairs would cause a stir in Surrey’s quiet provinces, and no one can be sure of what scandal played out across Claremont’s acres. Most famous of all Claremont’s residents was the royal couple Charlotte, Princess of Wales and her husband Prince Leopold, who married and received Claremont as a wedding gift from parliament in 1816. The young couple took great interest in the grounds, creating a gravel path around the garden, turning the Belvedere into a conservatory and establishing the Camellia House, one of the first greenhouses of its type, in a sunny position near the top of the gardens. It was their place to relax after dinner, to study the specimen plants and take in the views. The foundations of this building remain in place, as do some thriving Camellias – some of which are thought to originate from the early 19th century when they were first introduced from Asia. The couple also commissioned the building of an ornate teahouse above the amphitheatre – said to be Charlotte’s favourite place. In response to the outpouring of national grief, Prince Leopold opened Claremont to visitors. In tribute to her memory he also had Charlotte’s beloved teahouse remodelled as a mausoleum, with a bust of the Princess placed inside. Now just the outline of the foundations remain and a plaque simply states Leopold’s forlorn words, ‘My Charlotte is gone’. There are no signposts in the garden, but visitors are given a map pointing the way to the most spectacular sites of the season. People are encouraged to bring picnics and wander at their leisure, just as generations did before them.